The Men of the North, Gwŷr y Gogledd in the Brythonic Language, were the men who lived in Hen Ogledd, the Old North. Among them were the Gododdin, who lived in the area now known as the Lothians in the South East of Scotland. They’re the subject of an epic poem, Y Gododdin, the earliest known Welsh poem, thought to have been written sometime between the seventh and eleventh centuries. It is an epic account of how a force of 300 warriors road south from their homeland to fight in against the Saxons in a battle at Catraeth (now Catterick, North Yorkshire) where almost all of them are killed. The poem honours them for their valour and bravery. 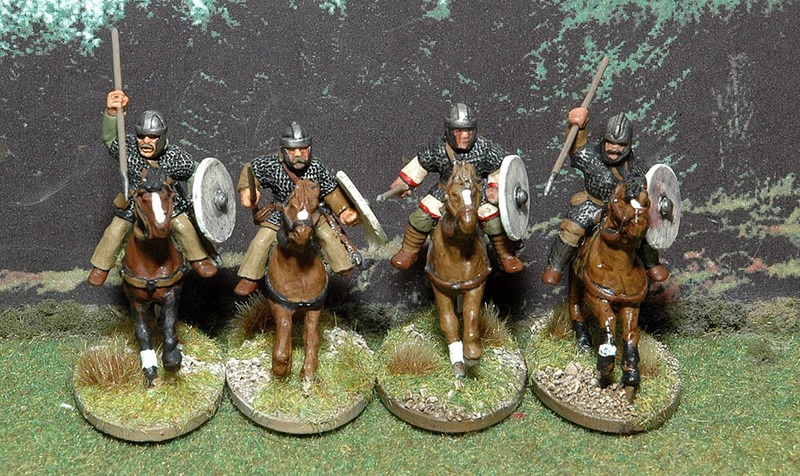 They’re an interesting force for Dux Britanniarum, a cavalry heavy variation of the standard British force. As a wargamer who lives in Musselburgh, just five miles to the to the East of what was the Gododdin’s capital in Din Eidyn (now Edinburgh) I had to have some. Here they are. The starting point for this force were the rather lovely 28mm Romano British Cavalry made by Footsore Miniatures (formerly Musketeer Miniatures) and they were my first choice of figures for the elite shock cavalry that provide the Gwŷr y Gogledd with their offensive punch. 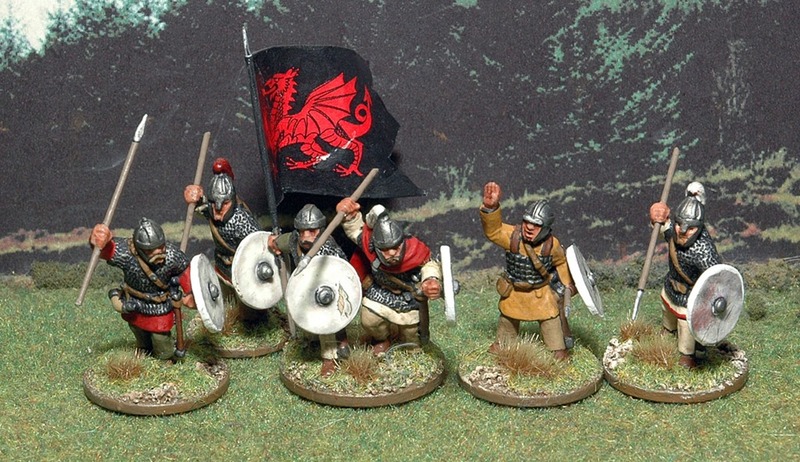 I thought about using other models from Footsore’s Late Roman/Romano-British/Early Byzantine range for the rest of the force, but they all looked a bit too Roman for my tastes. The Gododdin lived in the area between Hadfrian’s Wall and the Antonine Wall and I reckon they would have been a bit less Romanised than their cousins in the South of England and I wanted a more “hairy arsed” slightly barbarian look. I found what I wanted in the Footsore Goths. They’re a lot more hairy than most models that are sold as Arthurian British, beards and long hair abound, and they’ve all got trousers, while the British are often portrayed with bare legs. That suits me fine, I wanted hairy and it’s cold here in East Lothian and anyone exposed to the idea of trousers (as the Men of the North were during the relatively short period of Roman occupation) would realise that they were an excellent idea. Some of them are wearing fur waistcoats and a few of the armoured types have mail hanging from the back of their helmets. I can easily live with what might might be seen as inaccuracies, given that the overall look of the force is what I want. I have painted the force with a rather restricted palette, especially the lower class warriors and levy. The colours I have used are based on samples from natural dye workshop my wife went on a few years ago in which she spent a day trying out all sorts of dying techniques using plants occurring naturally in this part of the world. She came home with a load of hanks of wool in a variety of shades of brown, most of them yellowish brown and these have provided inspiration for the palette used. Men went to Catraeth with the dawn. Their bravery cut short their lives. For the space of a year the minstrel was merry. That’s as close to primary evidence as you get in this period. Having started the force in October 2014 (I drilled the hands out for spears whilst listening to the results of the Scottish referendum) I have now officially finished it. The box is full and I have all the troops I think I’ll ever need. The force available to me includes a total of nine six man infantry stands which I can arrange in a number of ways. By combining models with chainmail models with helmets and no armour and models with neither helmets or armour I can put together the following infantry. To add to the infantry I have one unit of elite cavalry, three of Warrior Cavalry and one of Light Cavalry. A group of archers and a group of javelin armed skirmishers complete the force. That’s a very powerful force indeed for Dux and I’ve got nowhere near getting it in any campaign. But it’s nice to have the toys ready just in case it ever happens. Here’s my Lord accompanied by his standard bearer and Champion and two mounted Leaders. I can’t envisage using all these at once, as it leaves the infantry a bit short of Leaders. But it’s nice to have the option of putting the Lord with Cavalry or using him dismounted with the infantry (see below). 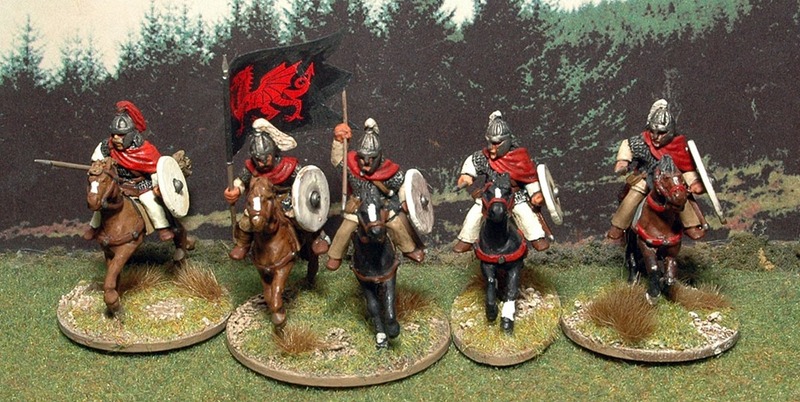 These figures are a mixture of Footsore Romano British Cavalry and Goth Noble Cavalry. Elite Foot: Footsore Goth Heavy Infantry I use models with chainmail and helmets to indicate elite infantry, they can be used on their own in both ranks for two groups of six Elites, or just in the front rank of four mixed units if I want to use more Elites. Warrior Foot: Goth Infantry helmeted variants are used as Warriors – on their own or mixed in with the bare headed infantry below. They can also provide a rear rank for Elite groups. Levy Foot: I use Goth Infantry variants without helmets on their own as Levy groups. Mixed in with the helmeted models above they can be used as part of Warrior groups. Javelin armed Skirmishers: Goth Infantry (variants without helmets) with Gripping Beast Bucklers. I have a few extra figures I can bring in when I want to use these figures to play Lion or Dragon Rampant. 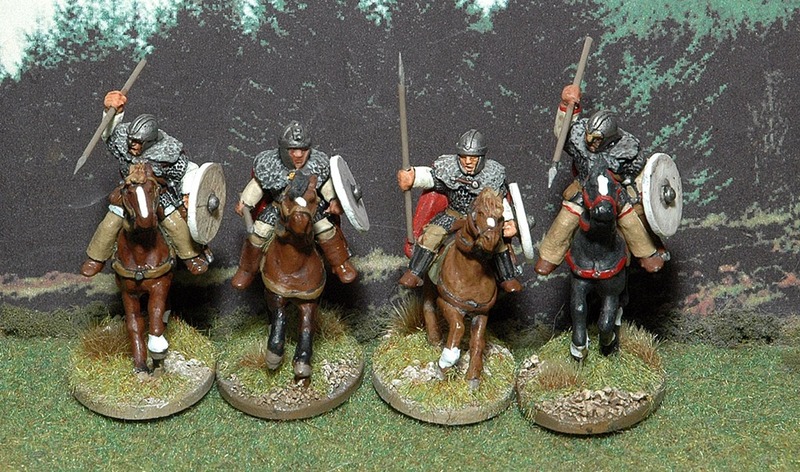 An extra two light cavalry allow me to form a six man unit of Light Riders and I have a Pictish Magus and Bard from Gripping Beast’s PCT15 Pict Characters 1 pack which I could use as spellcasters if required. Really nice unit and paint work, Derek. I was amazed to see just how little evidence their is for the Chi-Rho shield patterns that seem to have become accepted wisdom among wargamers. They look terrific, Derek and it’s lovely how you’ve tied them into the legends of your part of Britain. Bravo. I have my eye on some of the Footsore Goths myself. They are very nice figures.